Xiaomi Redmi 5 Plus is launched December 2017. This device comes with 18:9 display ratio. Because of now a day most of the device comes on 18:9 ratio. So Xiaomi comes two mid-range 18:9 ratio display ration device. This device powered by Octa Core 2.0 GHz CPU and it’s built on Qualcomm MSM8953 Snapdragon 625 chipset. Redmi 5 Plus has 12 MP rear camera and 5 MP front camera. This device available in 2 version, one of 3 GB and another 4 GB. 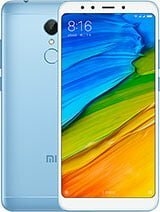 Mi uses 4000 mAh non-removable battery in Redmi 5 Plus. Sensors – Fingerprint, Accelerometer, proximity, compass, gyro, light. Primary – 12 MP, f/2.2 aperture, 1.25 μm pixel size. Wi-Fi – Yes 802.11 with Hotspot, Wi-Fi Direct. Build – Front Glass, aluminum body.